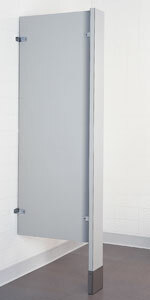 Restroom PLUS privacy and urinal screens are easy to maintain. Available in three installation configurations, and in a selection of six materials: solid plastic, plastic laminate, phenolic-black core, phenolic-color-thru, stainless steel, and powder coated steel. 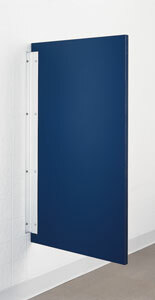 Restroom PLUS styles include post-to-ceiling, floor anchored, and wall hung screens. Shown with optional third set of stirrup brackets. Panels are 58" high by depth required. 12" x 42", 18" x 42", 24" x 42"
Shown with optional full height aluminum brackets.